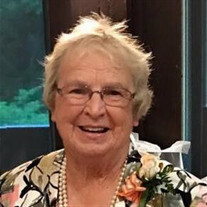 Becky Ruff, age 79, of Spindale, NC, died Saturday, July 14, 2018, at Carolina's Medical Center in Charlotte, NC. She was a native of Rutherford County and the daughter of the late Arthur Randall and the late Fay Lanier Randall. Becky was a member of Second Baptist Church of Rutherfordton. She was retired from the Rutherford County Tax Assessors office and was a loving mother, wife and grandmother. She was preceded in death by her husband Steve D. Ruff. Doug Ruff and wife Carla of Rutherfordton. Wade Ruff, Rebecca Ruff, Carrie Ruff and Kennedy Ruff. The family will receive friends from 1:00 PM to 2:00 PM, Wednesday, July 18, 2018 in the Family Life Center of Second Baptist Church of Rutherfordton. The body will lie in state in the sanctuary of the church during the visitation. The funeral service will be at Second Baptist of Rutherfordton at 2:00 PM, Wednesday, July 18, 2018 with Reverend Dr. Keith Stephenson and Reverend Brandon Wood officiating. Interment will be at Eternal Hills Memorial Park. Memorials may be made to Second Baptist Church of Rutherfordton at 191 Green St. Rutherfordton, NC 28139.